This article will show you how you can read xml file in dataset and populate in combo box using c# in windows application. For reading the XML file I have used XmlTextReader in c#.net. 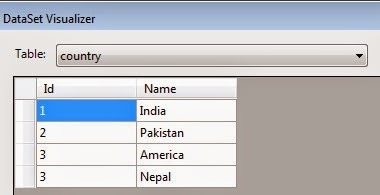 Some of my previous articles are as follows: How to Create Column Chart in Windows Application Using C#.Net, Windows Application - Excel Sheet Name in C#.Net, Bind And Display Image in a DatagridView Using C#.Net in Windows Application, WaterMark TextBox In Windows Applications Using C# and VB.Net. So for this article first we will create a new windows application and add a combobox in it. After this use the below code. In above code first we have read the xml file first and after that we have stored it into dataset. After storing into dataset we have passed to combobox as data source. As we run the code we will get the detail in data set as shown below.